turboSMTP can work easily as an SMTP server for Windows. Since the operative system’s new versions – from Windows 7 on – don’t come with an internal SMTP service, it’s necessary to rely on a professional third party one when you need to deliver emails from your website. 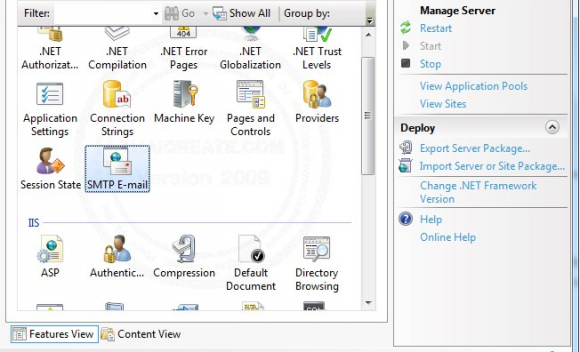 Once you have subscribed and got our server details, you just have to set them in IIS Manager, clicking on the “SMTP E-mail” icon and then making it sure to fill all the requested fields: the server name is pro.turbo-smtp.com; the default port is 587; and you can choose your favorite authentication process. If you’re a Windows user, getting a good SMTP server is very important. In fact, if you use a common, non-monitored SMTP email service, email providers’s antispam filters can reject your messages – even if they are legitimate. A reliable and professional SMTP service like turboSMTP, on the contrary, has a strong reputation among all ISP and will maximize the deliverability of your emails. It must use only reliable IPs. And also maintain a constant contact with all major email providers in order to guarantee that all your emails get to the inbox. It must provide a quicker email delivery. A dedicated SMTP doesn’t fall into overload issues and should enhance significantly the velocity of your mailing. It must bypass ISP filtering. A professional outbound server will maximize your delivery rate avoiding all the modern, aggressive antispam filters that can reject also legitimate emails. It must be accesible anytime and anywhere. If you’re on-the-go and using a different internet connection, you shouldn’t need to change your settings each time. It must keep track of your messages. To understand the results of your mailing, a dedicated SMTP service should provide also an accurate email tracking system. turboSMTP fulfills all these requirements, providing also a 24/7 customer support, that will help you to resolve any kind of issue. You can register and get a lifetime package of 6.000 free relays per month now, then choose a plan according to your needs.